In the last couple of days there was a discussion on the web on whether eye tracking is an effective technology for safe automatic driving and safe assistant systems. We are sure that eye tracking will be a very effective technology for the acceptance of driving assistant systems! In this article I will show you why. Let’s have a look at the costs for eye tracking devices. 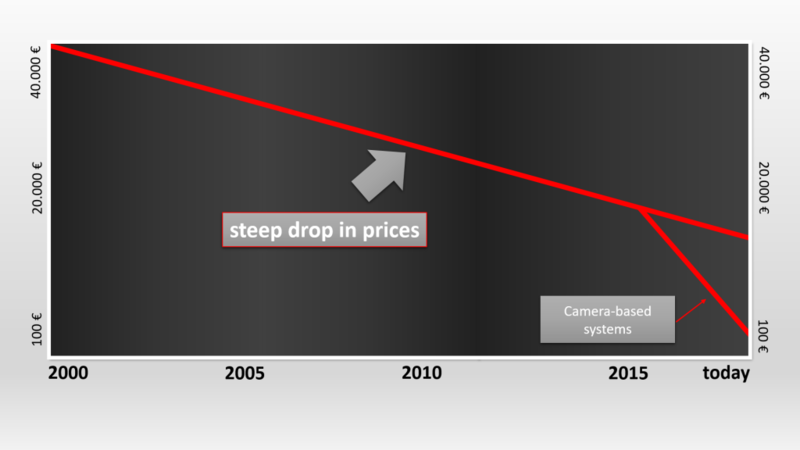 The chart below shows a steep drop in prices for eye tracking devices over the past 18 years. Today, the price for eye tracking devices is in the range of a hundred euros. The second point is robustness. This slide shows the worst case for an eye tracking device. The sun is shining directly into the driver’s face. There are already solutions on the market for this problem, and many companies and researcher are working in this field to improve the eye detection. The final argument are perception models. 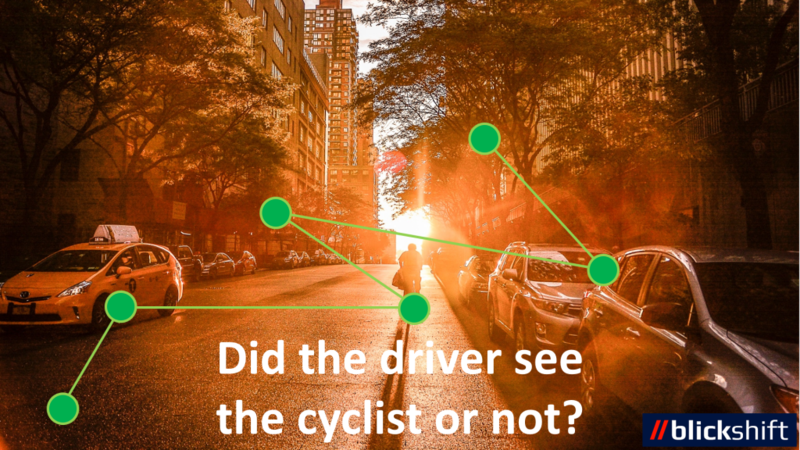 Once we have cheap and robust eye tracking devices, the question remains: Did the driver see the cyclists or not? Do I have to warn the driver or not? In level 2 and level 3 cars much information about the driver will be available: on the left side I have listed biometric information, on the right side information coming from the car. Our software solutions bring this information together. 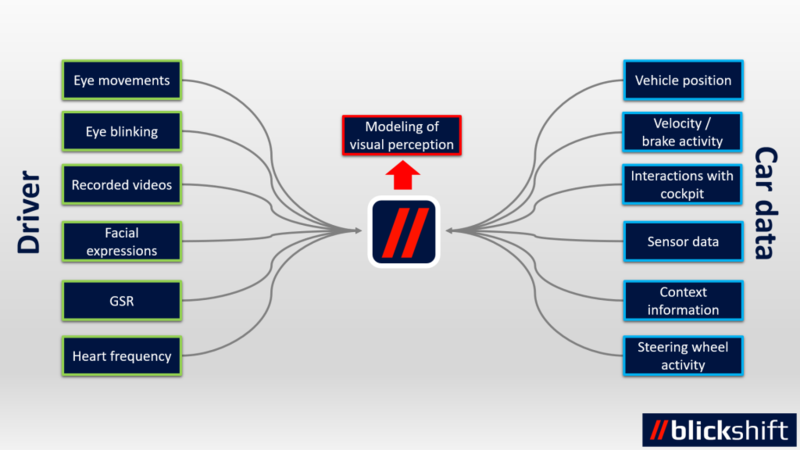 Our main product, Blickshift Analytics, leads to a very efficient analysis of large driving experiments and supports you in developing AI algorithms and perception models. So, I am sure, that the combination of cheap and robust eye tracking devices with perception models will lead to a very effective solution for safe autonomatic driving cars and safe assistant systems. Dr. Michael Raschke is Co-Founder and managing director of Blickshift GmbH and an expert for a visualization-based eye movement analysis. 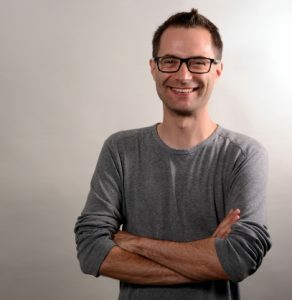 Michael is author and co-author of more than 40 scientific publications in the fields of eye tracking visualization, visual analytics, cognitive modeling and human-computer interaction. Thank you for sending your comments to the author directly. Watch a presentation of this article on YouTube.